The secret anti aging weapon of the stars is now available to the public. * Brad Pitt, Angelina Jolie, Jennifer Aniston and Kim Kardashian are all reported to be advocates for the youth creating benefits of Collagen Induction Therapy. The perfect introduction to Clinical Skin Needling Treatments. A facial with a fresh .25mm home roller will demonstrate to you how to use your roller at home. At the end you will take this roller home with you to start acclimatizing your skin to needling treatments. Microneedling is not collagen induction therapy, it will however stimulate cellular regeneration and exfoliation. Experience the natural skin rejuvenation wonder of collagen induction therapy with this dermal rolling facial. This clinical skin needling facial will help to restore skin firming collagen production & remove surface damage that causes the skin to look rough, dis-coloured & uneven. Includes vitamin infusions and spa massage. An ultra refining, retexturizing non blood vampire facial combining collagen induction therapy, epidermal growth factor stem cell infusions & a soothing clinical masque treatment to achieve a smooth, refined and luminous complexion. Perfect for skins with large pores, acne scarring, coarse skin texture, sun damage, surface pigmentation, fine lines and wrinkles. Clinical depth dermapen C.I.T treatment will activate a dramatic stimulation of collagen production & removal of damaged scar tissue via sped up skin exfoliation. A course of 6 treatments, monthly, is advised for best results on scarring, enlarged pore, wrinkle smoothing & stretch mark revision. Ask your clinical skin therapist for discounted pricing on treatment course packages. Clinical depth dermapen treatment will activate a dramatic stimulation of collagen production & removal of damaged scar tissue via sped up skin exfoliation. A course of 6 treatments, monthly, is advised for best results on scarring, sun damage, wrinkle smoothing & stretch mark revision. Ask your clinical skin therapist for discounted pricing on treatment course packages. The best way to repair, smooth and remove scar tissue is with Skin Needling. Pitted acne scars, trauma scars and surgical scars can all be treated effectively with clinical skin needling. * Have your treatments 4 weeks apart until your skin is smooth and refined. Stretch marks are internal scarring caused by tearing of the skin. This condition is commonly found in puberty, pregnancy & other conditions that cause rapid weight gain. These unsightly dermal scars can be repaired with Clinical Skin Needling. * Topical anesthetic may be applied for skin needling treatments if you require a pain free experience. A course of 6 x monthly treatments is advised initially. Results may vary due to health, genetics and skincare factors. After numbing the skin with an approved TLA your skin therapist will selectively treat areas of stretch marks with a gamma sterilized single use dermal rollers with 600 clinical depth needles. This surface trauma event will significantly increase the skins rate of cellular, collagen and elastin production to quickly remove portions of damaged skin and replace it with firm, plump and fresh skin cells. After numbing the skin with an approved TLA your clinical skin therapist will selectively treat areas of stretch marks with a gamma sterilized single use dermal rollers with 600 clinical depth needles. This surface trauma event will significantly increase the skins rate of cellular, collagen and elastin production to quickly remove portions of damaged skin and replace it with firm, plump and fresh skin cells. A more comfortable option to skin needling. Using micro channels of Infra Red Laser this laser treatment will significantly increase the skins rate of cellular, collagen and elastin production, speeding up recovery due to the skin remaining in tact. The most popular treatment for stretch marks as the down time is minimal with little to no risk of infection. 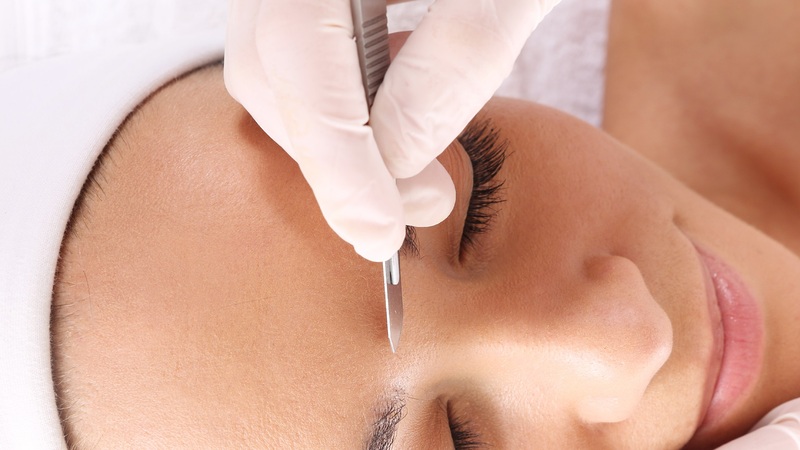 Dermaplaning, Epidermal Blading, Dermal Edge Peel or EpiBlading is a treatment that uses a surgical blade to dramatically level out the surface of the skin. This process will reveal smooth, hair free skin with refined pores and lifted features. Ideal for anyone desiring a flawlessly smooth complexion. * Beware the feeling is addictive, most return within a month for a maintenance treatment. Our signature dermaplaning process to scrape away scarring, sun damage, vellous hair & fine lines. A flawless complexion with refined pores can be achieved with this contour defining wonder facial. All results with lots of spa rituals at no added cost. A seriously addictive facial. Our signature dermaplaning process will be extended to the neck and decolletage to scrape away scarring, sun damage, vellous hair & fine lines. A flawless complexion with a younger looking neck & decolletage can be achieved with this contour defining wonder facial. The ideal treatment for the correction of Keratosis Polaris, sun damage, scarring and unwanted hair on the arms. With every treatment you will see imperfections fade, skin tone firming and the skin will smooth out to reveal more youthful and attractive arms. The best time to attack skin discolouration is when the skin is freshly exfoliated. Adding a pigmentation peel to your epiblading treatment will get you better results at fading sun damage, pigmented scarring, dyschromia and melasma. Oxygen therapy is the ideal addition to an epidermal leveling facial when acne & reactive skins are in need of clarifying, revitalizing, sanitizing and soothing post treatment. The addition of LED light therapy to your dermaplaning treatment will speed up collagen & hyaluronic acid production, repair scarring, tighten the pores, brighten pigmentation and calm the skin. The best way to take your facial from short term surface results to long term dermal results. Get glowing skin for a special event. Which stretch mark treatment is right for me? Both Skin Needling and Fractional Laser are very effective. Most choose a treatment based on their pain threshold, post treatment recovery time, budget and how quickly they require results. Your Clinical Skin Therapist will discuss the options with you in your personalised treatment planning session. Is there any down time from stretch mark treatment? Emerge fractional laser will give you the least amount of down time as the treatment does not break the skin plus redness and swelling from the treatment will usually subside within 24 hours of treatment. Skin needling may be the less expensive option but it does carry a measure of risk for infection due to the skin being broken to cause a state of heightened repair. The skin will be tender for 3 – 5 days with skin needling so it is not advised to be performed on the inner thighs as skin rubbing can cause bacterial infection or chaffing. The answer to this question will depend on the size of the area to be treated, the type of treatment performed and the depth of the damage sustained. Your clinical skin therapist will consult with you and inform you on the best course of action and the approximate number of treatments required. As a rule of thumb most will need at least 6 treatments to get an acceptable outcome with some needing to continue on until they are happy with the results. How often will I need to return for treatments? Treatments for Emerge fractional laser can be performed fortnightly on the body and weekly on the face as the recovery process is quicker than skin needling. Skin needling treatments are every 2 – 4 weeks depending on how quickly the skin regenerates itself. Epiblading or Dermaplaning is a monthly treatment to maintain smooth, hairless skin on the face. Do you perform laser skin resurfacing too? Yes we do. Emerge Fractional laser is our non invasive, low down time laser of choice. This laser resurfacing treatment is very effective on fair to medium skin tones for the resurfacing of rough and irregular skin texture. Ideal for post acne scarring, oil trauma scars, fine lines, enlarged pores, wrinkles and surface sun damage related pigmentation.